A selection of some of the treats available in Cheryl Wixson's kitchen share. 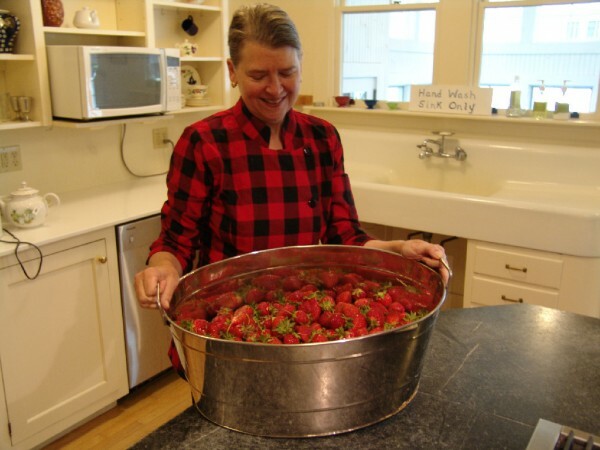 Cheryl Wixson enjoys some Maine strawberries in her kitchen earlier this year. BANGOR, Maine — Two years into it, and Cheryl Wixson’s test kitchen is cranking out so many jams, pickles, sauces, dressings and other preserved treats that she can hardly keep up. Pumpkin butter one week. A garden fresh salsa the next. Cranberry ketchup. Marinara sauce. Zucchini relish. Aroostook Four Grain pancake and waffle mix. All made from Maine-grown foods, sourced from local farms. Fortunately for Wixson, the harvest season is just about wrapped up, so there’s only a few more days of production before it’s all complete. Although they enjoy the Bangor area, for logistical purposes Wixson and her husband and business partner, Flip, hope to move the operation to Stonington next year where they now live year-round. The business runs on the same premise as a farm share, in which the consumer pays upfront for a monthly or weekly amount of produce from a farm. In this case, the consumer pays $300 for six months’ worth of mostly organic, canned or boxed goodies to stock in the pantry. Last year, the kitchen share’s first year, Wixson sold about 50 shares; this year, she’s hoping for 100 or more. Though the first pickup date is Nov. 1, interested buyers can purchase their share at any point in November. There are pickup locations in Bangor, Belfast, Blue Hill, Brunswick, Deer Isle, Ellsworth, Freeport, Rockport and Unity. Shareholders can expect at least one pasta sauce or salsa, an array of jams, pickles and marinades, and at least four specialty items a month, from tapenades to dry mixes. In all, you get 54 items from November until April. She has been able to cultivate relationships with many of her providers, and notes that the new wave of farmers — young people in their 20s and 30s, many of whom are transplants to Maine from elsewhere — are finally starting to take over for the older generation of farmers. To sign up for a share, visit cherylwixsonskitchen.com or call 947-0892.